International Journal of Research in Health Sciences,2019,7,1,9-13. Department of Microbiolgy, Dayanand Medical College & Hospital, Ludhiana. Background: Acinetobacter baumannii is an emerging cause of nosocomial infections. These infections are difficult to control and treat because of the increasing antimicrobial resistance worldwide. Objective: To study the incidence of ESBLs, AmpC ß-lactamase and metallo ß-lactamase producing Acinetobacter baumannii. Material and methods: The isolates of Acinetobacter baumannii obtained from all samples received in the department of microbiology over a period of one year were further characterized as of ESBLs, AmpC ß-lactamase and metallo ß-lactamase produuers. Results: Out of the 380 A.baumanni isolates, 373 (98%) were probable ESBL producers and 37(9.7%) were confirmed ESBL producers. 96.3%(366) of the isolates, were probable AmpC producers, whereas only 180 (47.3%) isolates were confirmed AmpC producers. 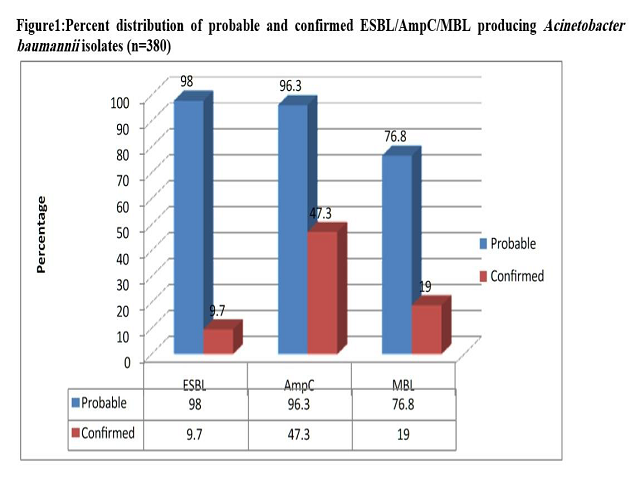 Further, 292 (76.8%) isolates were probable MBL producers and very few, 72(19%) could be confirmed as MBL producers. Conclusion: The high prevalence of resistance in Acinetobacter isolates emphasizes the need for early detection so that it can help in providing appropriate antimicrobial therapy and also to combat the nosocomial infections.